Align single disc clutches on American and imported cars, light trucks and tractors. Adapter fits through clutch plate and into pilot bushing or bearing. Tapered cone fits into clutch hole and aligns clutch plate properly. 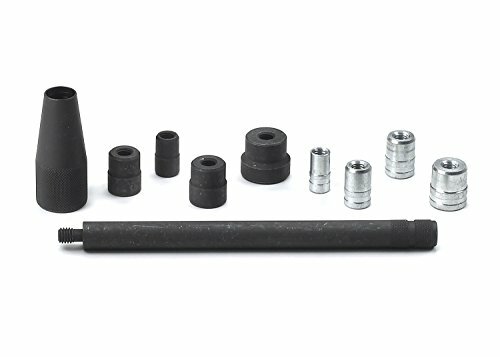 Set includes shaft and 8 two-stepped pilot bearing adapters covering 16 sizes. The plate aligning cone has 1-1/8_ maximum diameter taper. Includes Zinc adapters for Import: 0.472" and 0.500"; 0.622" and 0.641"; 0.688" and 0.710"; 0.826" and 0.875"
Black adapters for domestic: 0.561" and 0.590"; 0.749" and 0.787"; 0.812" and 0.874"; 0.984 and 1.181"
Pilot bushing cone taper size: 0.734" to 1.17"